In a perfect world, every home would be equipped with a heating system that warms every room evenly. However, as most homeowners can attest, that’s usually not the case. There’s always at least one room that lags behind in terms of comfort. Usually, it’s that tricky room above the garage, a sunroom, a cold basement, or a kitchen or bathroom with chilly tile floors. These rooms can often be impossible to get to a comfortable temperature without supplemental heat. If you’ve ever wondered, “Why is one room in my house so cold?,” you’ve probably already realized you should look into some supplemental heating solutions. The most efficient supplement heating source is electric floor heating; it is virtually 100 percent energy efficient because all the heat it produces rises up through the floor, as long as it is properly insulated. With a boost of supplemental underfloor radiant heat, cold rooms can be transformed into functional, comfortable spaces once again. But in order to make the transition from cold to comfortable, you’ll need to know these five tips. 1. Use underlayment on a slab. Nothing steals heat like a concrete slab. That’s a big reason why the basement is usually the coldest part of a house. However, by adhering cork or synthetic cork underlayment to the slab before installing a floor heating system, you can ensure that the heat will travel upward through the floor instead of downward into the slab. Think your basement will always feel like a cold dungeon relegated for storage; or that your sunroom will never be usable during the colder months? Think again. This is a simple installation step that will tremendously benefit any cold room on a slab. 2. Adjust your primary heating source. If you’ve been turning up the thermostat to compensate for the cooler rooms in your home, you can save a load of money by adding supplemental radiant heat. When you install in floor heating in the rooms that have a hard time keeping up with the rest of the house, you can lower your whole home thermostat by 2 to 4 degrees. Then, just turn on the floor heat when you need it in the cooler rooms to get the comfort you’ve been seeking. This will save a lot of energy — and therefore money — over the course of a season. Plus, if you install a floor heating system in your bedrooms, you can turn the whole home thermostat down even further while you sleep because your heated floors will take over and keep you warm. Imagine the savings! 3. Set cooler rooms to room temperature. To ensure your entire home is heated evenly, install heated floors in the cooler rooms of your house and set the floor heating thermostat to room temperature. This setting will read the ambient (air) temperature and only energize the floor when it lags behind the rest of the house. As a result, you can effectively eliminate the “cold spots” in your home. Alternately, if you're using a floor heating thermostat like one of the models in our nSpiration series, you can make use of the floor sensor (which is installed between heating cables during installation) to control the system based on the temperature of the floor itself. Some of our thermostats even allow for a combination of control based on both the ambient room temperature and the floor temperature. This is useful for maintaining proper room temperature while not exceeding any floor temperature limits set by the manufacturer. 4. Choose an appropriate floor covering. When installing a radiant floor heating system, you will need to remove the existing floors prior to installation. That’s why it’s important to select a floor covering that will be a great companion to your new supplemental heat source. 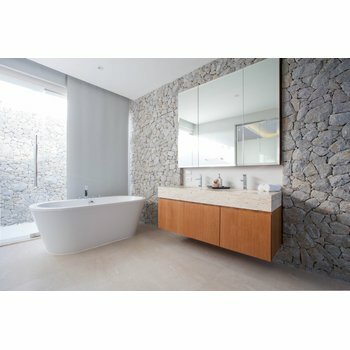 WarmlyYours floor heating systems work with nearly any flooring type; however, tile and stone are generally the most conductive and most popular. Regardless of the flooring type you choose, you’ll want to be sure you comply with the flooring manufacturer’s maximum temperature limit, if applicable (this is only true for flooring materials like wood, laminate, and luxury vinyl tile/planks). This will ensure your floors and your heating system will remain in tip-top condition for years to come. 5. Use a programmable thermostat. Once your floor heating system is installed, you’ll want to hook it up to a programmable thermostat to save even more energy. By using a programmable thermostat, you can save around $180 a year, according to Energy Star. It pays to turn your system down or off when you know you won’t be using it! 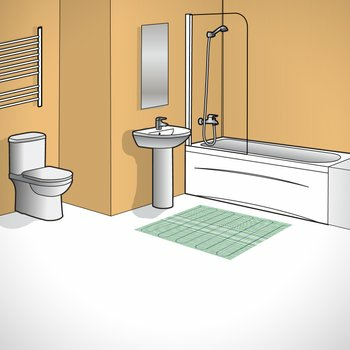 For instance, if your bathroom floors are heated, you can set the system so that your floors are toasty warm for you when you step into the bathroom in the morning, but cooler while you’re at work or sleeping. Or, if you live in the Southwest, you can heat your bedroom and bathroom floors during those cold nights and mornings, but keep them off the rest of the day. Maximizing your system’s energy efficiency will save you money without sacrificing comfort or convenience. With these tips in mind, it’s easy to see why radiant floor heating is an ideal secondary heat source. It warms up the coldest rooms in the house, works with nearly every floor covering, and is energy efficient. If your home is suffering from a cold room, be sure to look into a radiant floor heating system. You can get started with a free quote and even find out if your home is a candidate for floor heating as your primary heat source. We’re confident that the more you learn about floor heating, the more you’ll be convinced that it’s the supplemental heat source you didn’t know you needed. Can Underfloor Heating be a Room’s Primary Heat Source?